BluPure showed up to help with my problem. 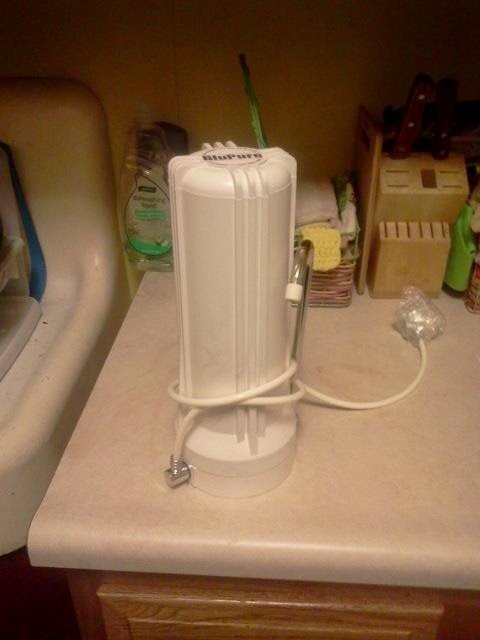 It is a countertop filter system, that hooks up to the faucet on the sink and sits beside the sink. You never have to take it off of the faucet either. Simply turn the knob to go between water from the filter and normal water into the sink. In seconds, you will have some amazing water to drink. After I got BluPure, I noticed that it is big and clunky. It is also a bit heavy. I knew that it would be an eye sore, but I was willing to overlook all of this to have some water that was ok for me to drink. When I went to put it on our faucet, I noticed that it would not fit. Since I don't spend my own money on review items, I knew I wasn't going to buy an adapter. 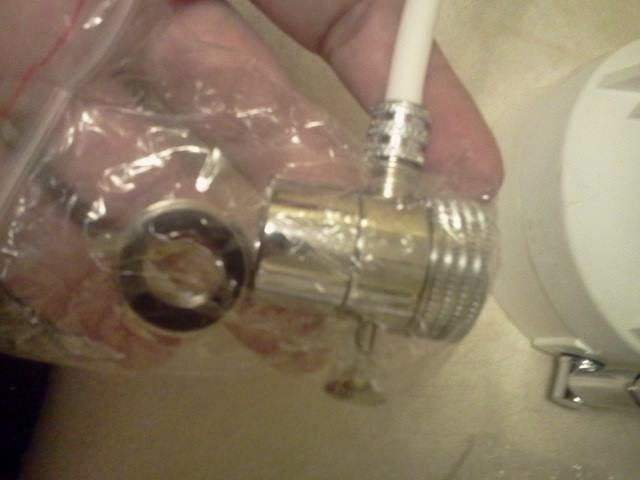 So I went on the look out for someone who has a faucet that this will fit on without having to remove or buy anything. Every weekend we go and hang out with our friends. Once we got there, a light bulb went off in my head. 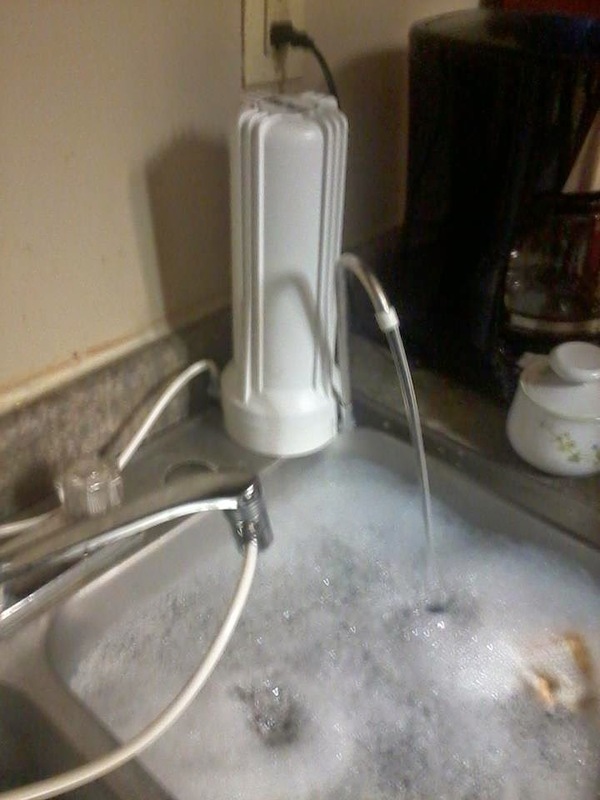 I saw the sink, and I knew the BluPure water filter would fit it. So the next day we took it over there. Within seconds the BluPure was hooked up and ready to go. Water came out on both sides, with ease and a turn of a knob. We noticed that right after it was hooked up and the water was coming out the faucet instead of the filter, the filter started to drip, where the water comes out. The drip got pretty annoying and went on until all the water was out of the system. We were all happy when that dripped stopped. So we made sure that it was positioned over the sink in a way that the water would go into the sink and not all over the counter. Once we tasted the water that came through the filter and the normal water, we noticed that the filter water was a lot better then the normal tap water. There were still things in there floating around that we weren't sure about, but the taste is better at least. I haven't noticed any change in the way my body reacts though. I still get the runs and stomach problems, but I feel much safer drinking water out of the filter then normal tap water. 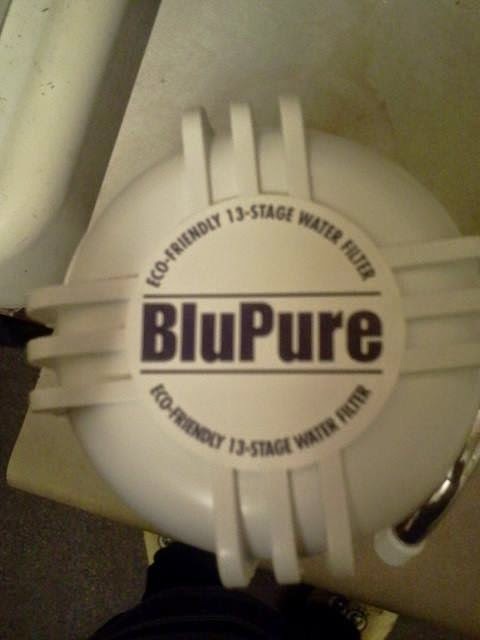 If you are looking for a water filter, then BluPure may be what you are looking for. Head on over to Amazon and check out the product page by clicking here. From there, you can find out more about the product, see what other people are saying about this product, and buy a water filter for yourself!